One of the questions I get about grafting is how in the world did people discover that you could take two different plants and combine their disparate tissues together? I think people of old knew grafting was possible because they had seen plant tissues recombine in nature. Naturalists were outside surveying their environment, and from what they learned from nature, they applied that knowledge to grow plants better. We have a massive chinquapin oak (Quercus muehlenbergii) in our front yard in Tennessee. A few years ago, I noticed for the first time in our thirty years of living there that it has a natural graft on the back side. It is more unusual than most that I’ve seen because three branches come together. Thread this needle. On the back side of the tree is this natural graft where three branches have become one. Here’s a side shot. You can see a branch behind curve up and down to merge with the other two branches. These natural grafts have been known to occur for a long time. This bulletin from Kew printed in 1917 (over 100 years ago!) describes the process well. 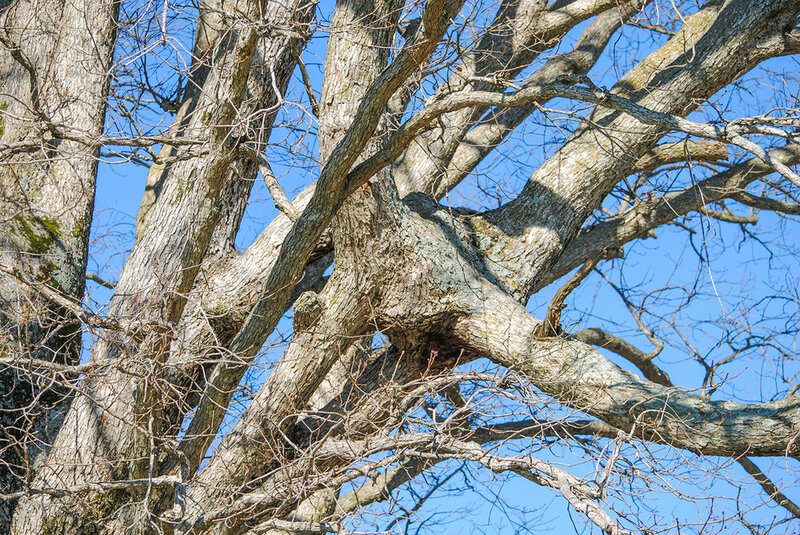 Branches rub off the outer bark in the wind, callus (wound) tissue forms, and eventually the tissues on the two limbs grow and conjoin together. It is so fascinating to think about the process of how the vascular tissues of large branches can realign and to witness the products of a years-long process.